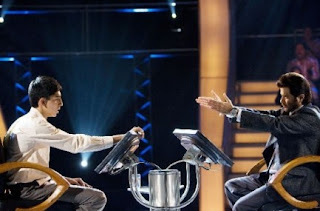 Slumdog Millionaire is more than your typical rags-to-riches movie. This film follows Jamal Malik (Dev Patel), a young adult who grew up in the slums of Mumbai, as he wins twenty million rupees on the Indian version of "Who Wants to Be a Millionaire?" But what makes his story unique is that he won the grand prize because of all the things that had happened to him amidst his life of poverty and oppression. We learn, through flashbacks after each question in the game show, that Jamal lost his mother when militant Hindus ravaged his neighborhood, and that he and his brother Salim (who are both played by several young actors throughout the film as they age) escape into a life of extreme poverty. We learn that, as children, the two brothers (along with a newfound friend Lakita) were exploited by abusive human traffickers, but subsequently escaped by train, eventually ending up begging and stealing money at the Taj Mahal. We learn that in their early teens, Salim finds and kills the leader of the traffickers, leading to his own devolution into a life of crime - while Jamal ends up serving coffee at an international calling center. Finally, we learn that Jamal was on the show just to give hope to his childhood sweetheart Lakita (Freido Pinto), who is cloistered as one of many young girls at the beckon call of an Indian mobster. These stories remind us of the unfortunate poverty that sweeps across India and other third-world areas around the globe. If for no other reason than to be made aware of this destitude that occurs beyond our borders, this movie is well worth it. In the United States, we often forget the millions of people across our planet who live in such deplorable conditions, and a film like Slumdog Millionaire can help us regain that awareness, and challenge us to do more to eradicate poverty, and the conditions that bring it about. As Christians, we are called to give special attention to the poor and helpless, wherever they are. Jesus told his followers, who were all below the poverty line of their day, "Blessed are you who are poor, for yours is the Kingdom of God. Blessed are you who are now hungry, for you will be satisfied. Blessed are you who are now weeping, for you will laugh again." (Luke 6:20-21). In Luke's Gospel, we see a savior whose first mission was to the poor, the outcast, and the unloved. We see a Jesus (who himself was quite poor) reach out to those who could not help themselves, and give them a confidence and happiness like they never knew before. In this movie, it was Jamal who gave hope and inspiration to millions around India, as the poor huddled around television sets to watch one of their own move beyond their poverty. And what made it even more special was that Jamal did not go on the show for the money - but rather for the love and compassion of another, namely his friend Lakita. In our lives, while we may not experience the extreme conditions that we see in the movie, we can get downtrodden by the economy, our jobs, stress and pressure, or the mounting expectations that others hoist upon us. We can focus inward and enter into a time of self-loathing and survival, just to make through one more day. We can go through life like this, throwing up our hands and getting angry at the world for our lot in life. Jamal Malik should be an inspiration for us, too, if we fall into this trap. Despite our worst days, Jesus calls us to provide for one another. It is in giving that we receive, and if we look beyond ourselves and our problems to help others around us, we will surely receive that happiness that Christ promised in the Sermon on the Plain in Luke's Gospel. In addition, Slumdog Millionaire reminds us to be grateful for our life, every minute of it. Because of the events in Jamal's life, he was able to use them to win his twenty million rupees. In our own way, we can use our past to help our future. What happened to us when we were younger that might help us and help others in the here and now? It's not easy to do this. It requires some self-discipline and humilty of understanding. Ignatius of Loyola, the founder of the Jesuits, taught his students and companions a way to take stock of our past. He encouraged others to look back at every moment of the day just past, but to do it with a sense of thanksgiving - for everything, both the good and the bad. At the end of a day, he taught, thank God for all the things that occured since you woke up. Doing this day after day creates a discipline of thanksgiving for all that has happened. In looking back at his life, despite the poverty and ugliness he experienced, Jamal was able to find hope and inspiration for his future. In doing this, I believe that each of us can better understand Jesus as he says "blessed are the poor... the hungry... the weeping... those who are hated, excluded, insulted, and oppressed." Blessed are they because they have the tools to grow in spirit. They have the tools to help others. And they have the tools to eradicate hopelessness in our world.